We have been to Natalae’s house each of the past 2 weekends. That’s a lot considering we really don’t take all 3 kids many places without extra adults. Baby Sidney is just a few weeks younger than the boys and there are some very cool things about going to visit someone who a baby the same age as ours. 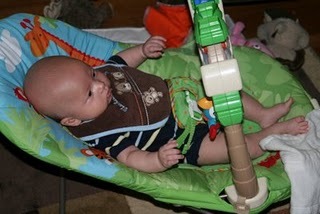 When we were there on the 3rd, Ruslan was completely captivated by Sidney’s bouncy seat. He was so intrigued that I searched for it online that night. After finding it was only available online, I ordered it that night. 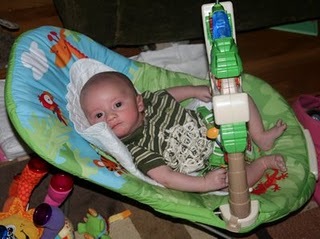 The Rain forest bouncy seat arrived just a few days later and it has not disappointed. 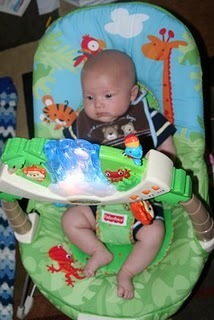 It is good for at least 15 minutes of busy baby when we need to be getting something else done. 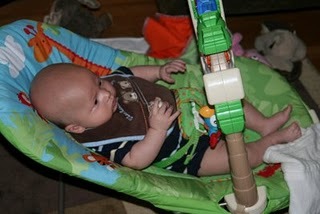 Ruslan loves it and Wyatt is becoming more of a fan each day. I try to only use it in small doses. 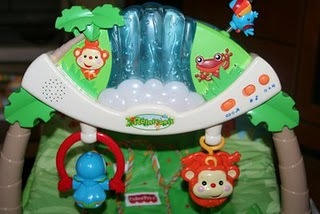 The best part is the monkey and lizard at the top – the monkey swings side-to-side and the lizard bounces up and down. Ruslan stares, smiles and talks to them and his arms and legs are in constant motion – he gets so excited.